Bike Ventures Camp is dedicated to connecting kids ages 8-12 to the outdoors and exploring the world by mountain bike. 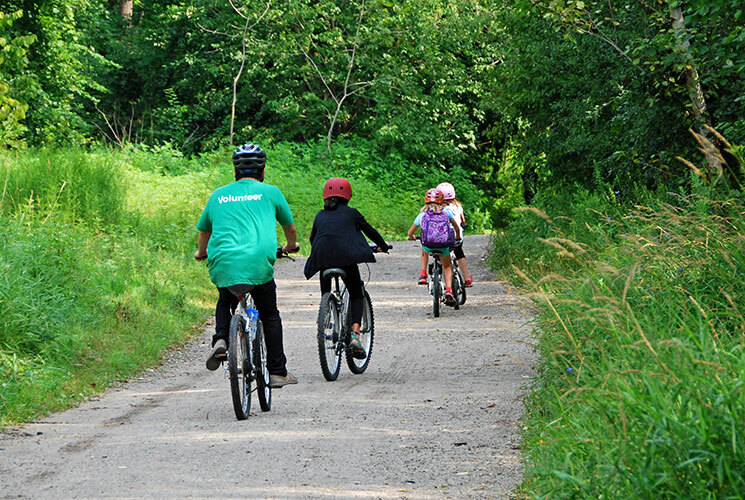 Campers will take part in skills sessions, trail rides, mechanical workshops, and nature play. Each child will leave with greater confidence on-road and on-trail. All campers should have good bike handling skills before registering. Level 1 campers should have good handling skills and should be comfortable riding in small groups. Level 2 campers should have good handling skills and experience riding mountain bike trails. To determine the best biking level for your camper, please refer to our Bike Ventures Levels PDF (42kb). Not sure where your child lands? Book a consultation. For information on our other summer day camp, visit Evergreen Adventure Camp. Evergreen offers a free parking window in all lots from 8:30-9:00am and 3:30-5:30pm every weekday during summer camp. If parking outside those hours you must pay at the meter.